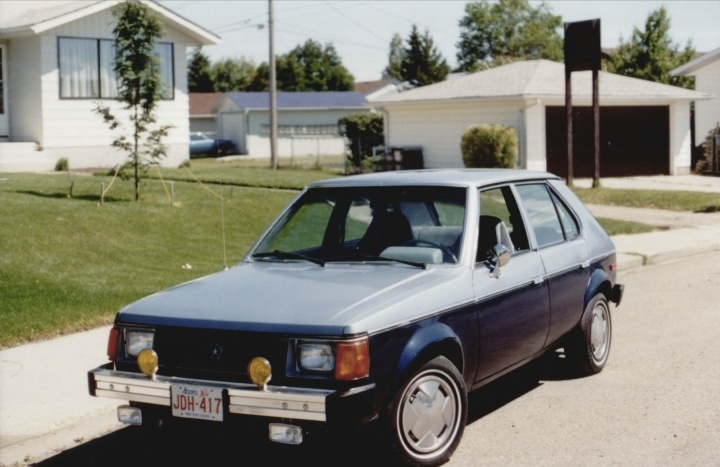 My first car was a 1982 two-tone blue Plymouth Horizon. With less than 100 horsepower, it is safe to say it wasn't a car that blew people away with its performance, so I took pride in how clean I could keep it. I was adamant about keeping it looking as pristine as possible and I became obsessed with washing it on a very regular basis. Ever since then, I have been obsessed with keeping my vehicles as close to showroom condition as possible. Things have come a long way from washing my car on my parents' driveway with dishwashing soap, but there is still a big part of me that takes pride when someone comments on the cleanliness of my car. Since owning this garage, I performed periodic details for close friends and family, but I have recently begun offering my services to select car enthusiasts that appreciate my detailing approach and style. I have no plans of "going pro", but I plan on completing a dozen or so projects per year. 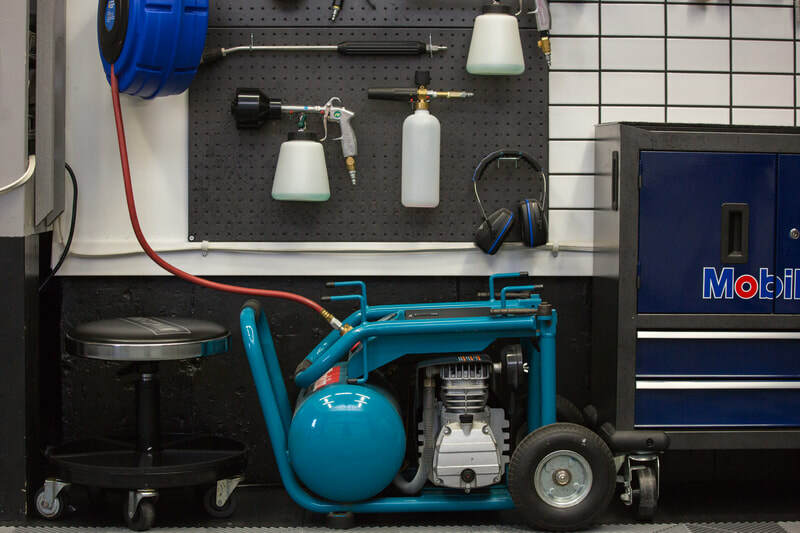 While I plan on remaining a hobbyist, I will admit my garage is equipped with virtually everything you would expect to see in a professional shop. My passion for detailing is evident in everything from the design of my space to the storage systems I have developed. It truly is my own personal detailing theatre. As with most things garage-related, my collection of detailing products has evolved. In 2008, when my wife and I returned from many years of overseas life, my love for detailing began to intensify. For years, I had dreamed of having my own garage space to pamper my car. 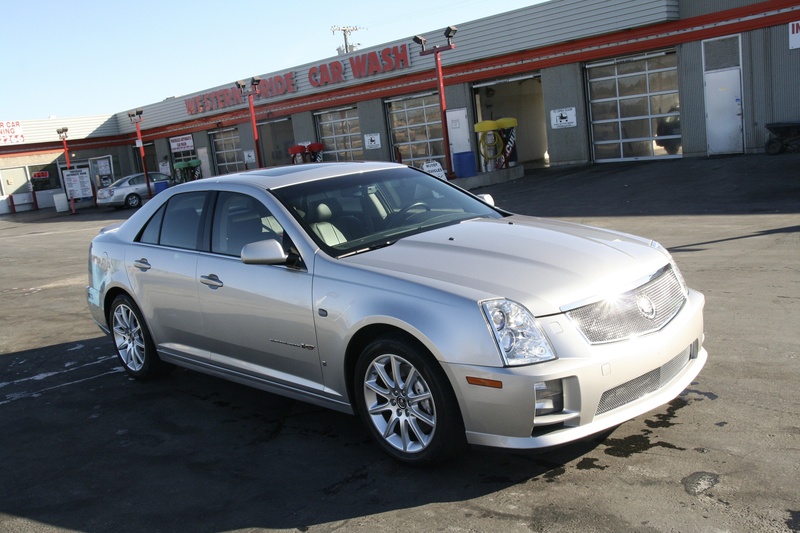 I bought an immaculate 2006 Cadillac STS-V and scoured the shelves of every automotive store in the city in search of products that would help me keep her in showroom shape. From there, I began to research new products and I quickly found myself making regular online purchases through Auto Obsessed in Edmonton as well as Carzilla in Calgary. 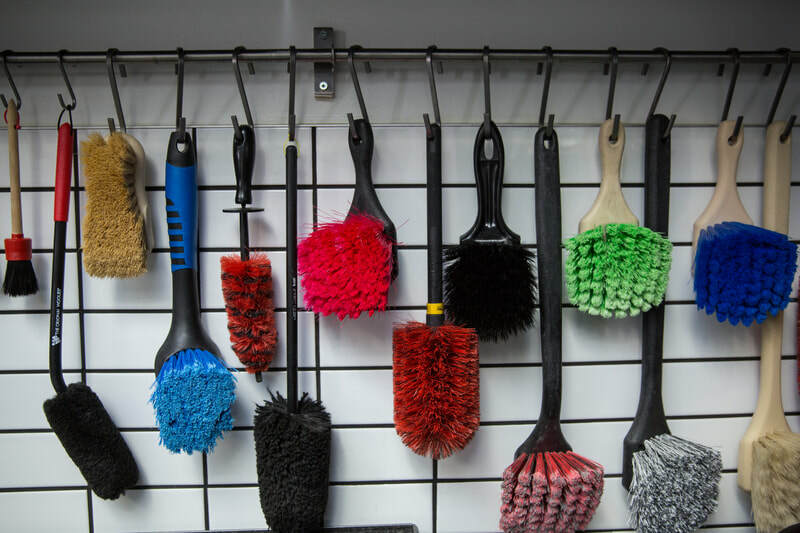 Auto Obsessed introduced me to Griot's Garage and I quickly amassed a comprehensive collection of their easy-to-use products. Then, I began branching out to other products with more specific uses. As with most obsessions, things did get a little out of hand. I soon found I had multiple products from various companies that performed the same basic function. It was around this time that my YouTube channel began attracting the attention of detailing product companies, and I began forging relationships that resulted in more uniformity and consistency to my arsenal of car care products. In 2017, I was approached by the team at Jay Leno's Garage to sample some of their products. I was flattered they were interested in supporting my detailing efforts and I enjoyed using their products on a number of projects, including the prep of my new SQ5. That partnership made me realize that my detailing efforts were being appreciated and that my reach within the detailing community was growing. I was impressed with the performance of the Leno's Garage line, but their lack of Canadian distribution resulted in expensive shipping and customs charges. I still have plenty of JLG products in my garage and use them on a semi-regular basis. 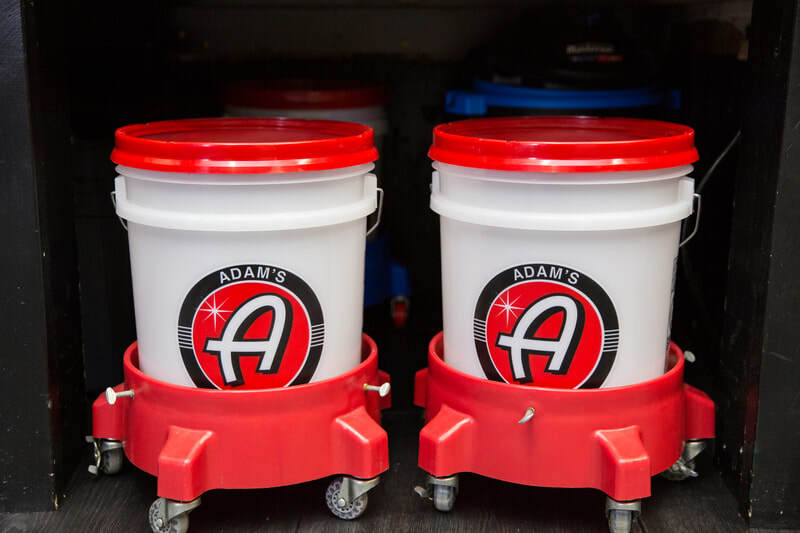 In the summer of 2018, I was fortunate to begin an exciting partnership with Adam's Polishes, and they have been very generous in helping me equip my garage with an extensive array of their high quality products. I am steadily expanding my collection while experimenting with as many products as possible. I can see why the company has such a dedicated army of supporters. In addition to making a quality product, they know how to generate excitement about their brand and I have had a lot of fun interacting with fellow Adam's users and collectors. At some point in the near future, RAD Garage will be an exclusive Adam's environment. When my detailing obsession began to take hold, I spent considerable time online hunting down the newest products to support my growing habit. I scoured the AutoGeek, eShine.ca, and other popular sites, but I spent the vast majority of my time perusing the various pages on the Autoobsessed.com website. Auto Obsessed is a brick-and-mortar detailing shop located in Edmonton, AB. 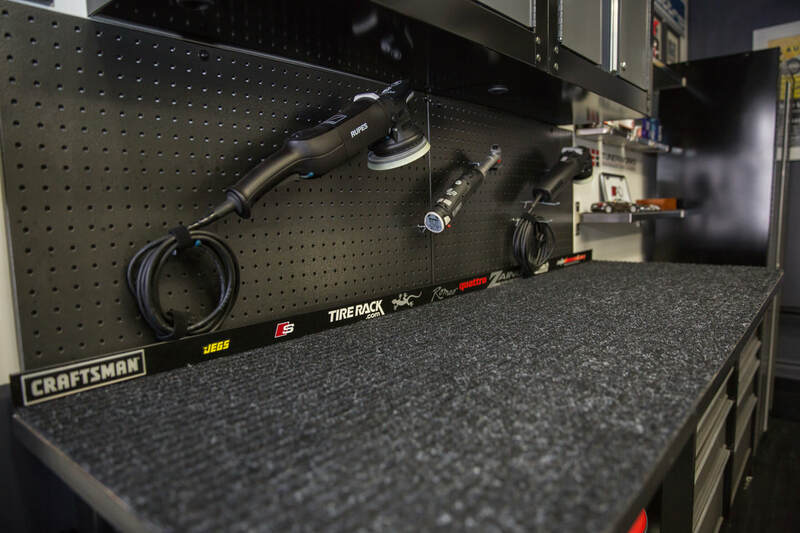 Troy and his team operate a comprehensive online shop that features all the heavy hitters in the detailing world and they have been successful in taking a lot of my money over the years. Troy is a master detailer and has launched his own line of high quality products under the OBSSSSD label. I was fortunate to have a few of those products sent to me and I was highly impressed with their performance. Over the years, I have come to know the owner of Carzilla and he has been very supportive of the work I do. He has been generous with his knowledge of various products and has always steered me towards products and tools that have allowed me to fine tune my process and results. He generously sponsored some projects I did with the Gyeon line of coatings. I found the Gyeon line to be very sophisticated and I was very pleased with the Syncro coating system I applied in the summer of 2018. 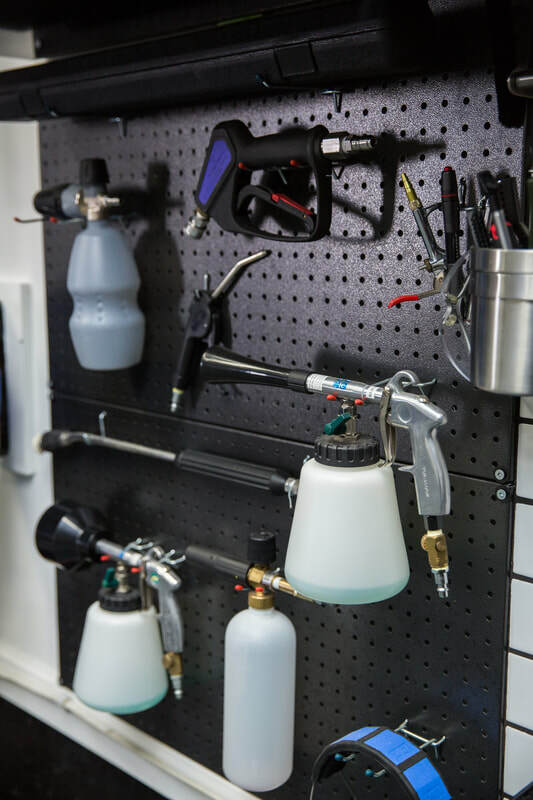 I am a regular visitor to Carzilla and I always enjoy chatting with Chris and seeing what is new in the world of detailing products and supplies. ​The Carzilla.ca website is comprehensive as well and offers Canada-wide shipping. In addition to the pursuit of the perfect detailing product, I am always on the hunt for tools that will help me perfect my craft. 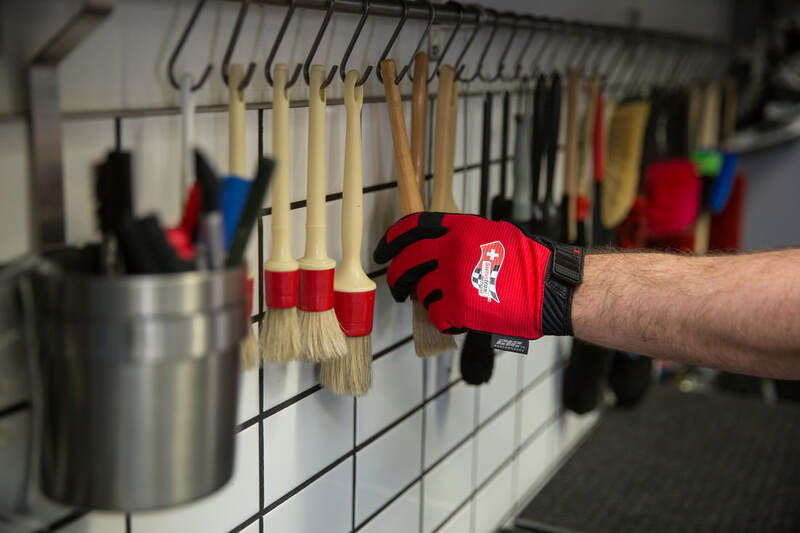 I have a considerable collection of detailing tools and equipment that help me achieve the results I am after. I have accumulated many brushes for many different uses and I keep them at the ready on hooks below my bank of cabinets. I have a comprehensive arsenal of polishers as well. I started out using 6" and 3" Griot's Garage random orbitals but I have since upgraded to various Flex and Rupes units. I went a bit crazy with pads and I now stock a plethora (yes, a plethora) of foam and microfibre pads to combat swirls and light scratches that inevitably invade a car's clear coat. 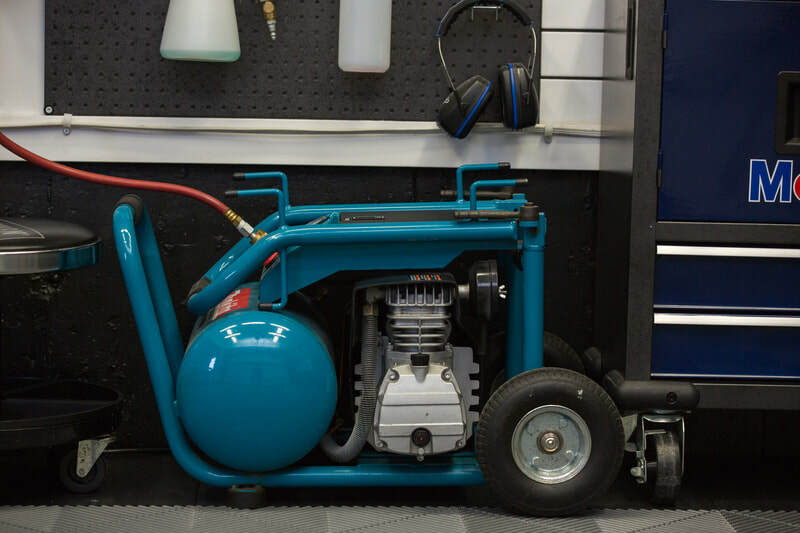 I have a Makita MAC5200 compressor that powers various pneumatic Tornador guns. Compressed air also allows me to effectively dislodge stubborn buildup and debris from the engine bay, dash, and other hard-to-reach and water sensitive areas. I have an extensive collection of microfiber towels that serve a number of specific uses. I have a few vacuums, a car dryer, numerous foam guns and cannons, a Mytee steamer along with other tools that are more at home in a detailing shop than in a suburban garage, but that was the dream and I'm feeling like the dream has been realized. Pretty much ever facet of the space is dedicated to organizing my collection of products and tools. 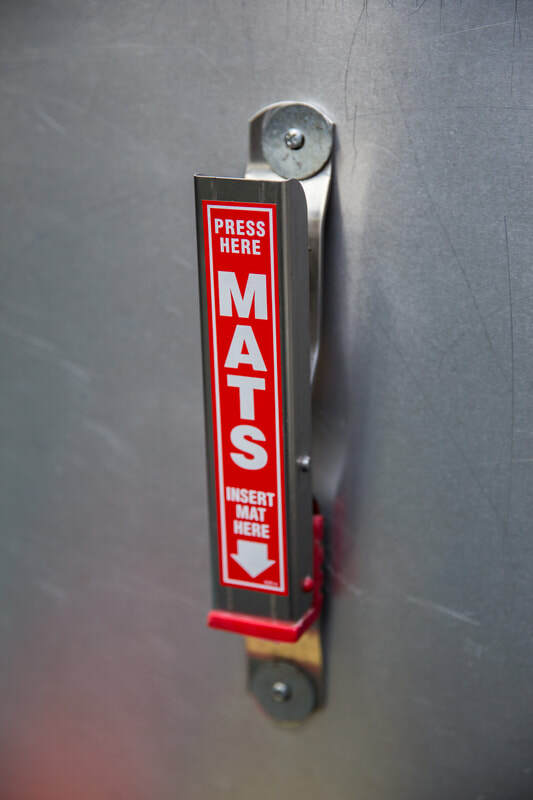 Most of my equipment stows away nicely in my Craftsman MD cabinets, but I keep my most commonly used tools at the ready. Whatever isn't on shelves, hooks, or bars is stowed in my Craftsman cabinets. I'm quite particular about the organization in my garage, so things are always evolving. One rule I follow is to only store things I use. If something doesn't see regular use, it doesn't stay in the garage. I take pride in sharing my detailing work through videos that showcase the art and beauty of the craft. I don't make "how to" videos, I make "this is how I do" videos. Creating videos is fun for me and I am constantly trying to bring innovation to my video projects. When I purchased my 2018 Audi SQ5, I insisted the dealer not perform any kind of prep work on the vehicle. Upon delivery in September of 2017, I took the car home and spent three days prepping her up. These videos demonstrate the process I followed to ensure she was ready for the road. This is a selection of previous detailing work I performed. My process has evolved over time, but each of these projects was completed with great attention to detail.